Rakhi in India is one of the most important festival and is celebrated with faith and enthusiasm. Rakhi festival in India is essentially celebrated by brothers and sisters and intends to strengthen the eternal bond of love shared by them. Rakhi is celebrated all over India and amongst all sections of Hindu society. Rakhi celebrations are however more prominent in North India. Number of legends are associated with the ancient festival of Raksha Bandhan. A popular legend of Rakhi from Bhavishya Puran narrates the story of Indra and Indrani. It says that once Lord Indra was facing reverses in battle against demons led by King Bruta. At this stage Indra sought help of Guru Brihaspati. The sage advised him to tie a sacred thread powered by mantras on the auspicious day of Shravan Purnima. Following the suggestion, Indra's consort Indrani tied the sacred thread on Indra's wrist on the decided time. The Rakhi helped Gods win the battle against the demons. From then on sisters' began to tie a Rakhi on their brother's wrist on the auspicious day of Raksha Bandhan. There are simple but set customs and traditions for Rakhi Day. People wake up early and take bath to purify their mind and soul. Sisters along with the mother prepare festive food including a sweet dish. A sister then arranges the customary Rakhi Puja Thali consisting of Rakhi, Tika, Mithai, Diya besides other traditional puja items to carry out the ceremony. 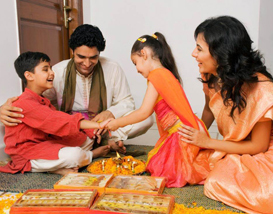 At the opportune time she ties Rakhi on her brother's wrist, apply tika on his forehead and perform arti of him. Praying for her brother's long life sister puts a sweet in bhaiya's mouth. Brother reciprocates by presenting Rakhi Return Gifts to sister and promises to guard her against all hardships in life. 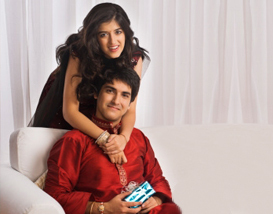 This simple Rakhi ceremony symbolizes and strengthens the eternal bond of love between a brother and sister. Auspicious day of Rakhi Purnima is celebrated all over India though under different names and with different set of rituals. 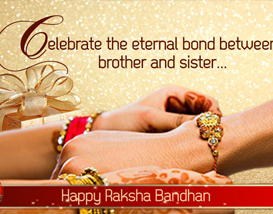 In North India, the festival is popularly celebrated as Raksha Bandhan. On this day sisters tie a sacred thread of Rakhi on brother's wrist and pray for his long life. Brothers' bless their sister and present them gifts. Regional names of Rakhi in rest of India include Nariyal Purnima, Avani Avittam and Balev. Read on to know more about these. 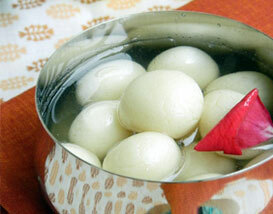 Narial Poornima or Coconut Full Moon: The festival of Rakhi is also known as Narial Poornima or Coconut Full Moon. On Mumbai's famous beaches, coconuts are thrown into the sea to propitiate the Sea God, Varuna, who is the chief object of worship on this occasion. Avani Avittam: Rakhi is called Avani Avittam in South India. This is the time of "upakarmam" and is celebrated in various ways all over South India. It falls on the full-moon day of the month of Shravan (August-September). 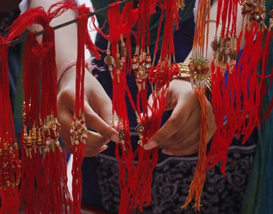 Rakhi forms an important Hindu festival in South India. Balev: Rakhi is also commonly known known Balev. This festival has special significance among Brahmins as it is the day on which Brahmins change their sacred thread. On Shravan Sud 15 when the moon is in the constellation of Shravan the Brahmins, while changing their sacred thread, rededicate themselves to study the vedas and pursue spiritual upliftment.